A Voltage Stabilizer has been created to maintain a constant voltage level automatically, offering protection to equipment against voltage surges, under-voltage, over-voltage, whilst smoothing impulsive noise. A Voltage Stabiliser is also referred to as an Automatic Voltage Stabiliser, AC Voltage Stabiliser or Voltage Regulator. An Automatic Voltage Stabiliser has been created to automatically maintain a constant level of voltage so that your electrical equipment would be protected at all times against over-voltage, under-voltage as well as surges, levelling impulsive noise. 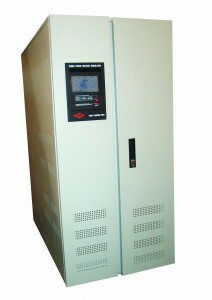 Voltage Stabilizer is also called Automatic Voltage Stabilizer, AC Voltage Stabilizer or Voltage Regulator. Your Voltage Stabiliser to regulate a fixed output voltage of a pre-set amount that remains constant no matter what changes occur to its input voltage or load situations. A Voltage Stabiliser is a device utilised for maintaining the voltage quantity stability in a power system. Should the power supplied to electrical appliances and devices dip and surge, the results will obviously lead to inferior performance as well as damage to your electrical equipment. It cannot be stressed enough how important it is to have a constantly high quality source of power to ensure that your apparatus runs properly at all times without affecting the performance which could often result in a depleted life expectancy of the appliance. Voltage instability and fluctuations will cause temporary and permanent failure of the load; these dips and surges reduce the life-span quite dramatically of home and numerous other appliances as these are unregulated lower or higher voltages than the requirements of the voltage load. Why the dips and surges? These are a direct result of faults within the power system, which makes the necessity of stable power voltage to the load at all times extremely important, and in so doing, protects all electrical devices at all times. In short, Voltage stabilisers are there to safeguard your appliances and devices against power instability and maintain a stable voltage supply to the load. Regulates the inconsistent input power voltage and output constant voltage. Fluctuations vary from country to country. Due to numerous recent outages, South Africa suffers greatly from unstable voltage. It is recommended that you equip Voltage Stabilizers to all appliances. Alternatively install a large AVR for your whole house or office. The Voltage Stabilizer is good for protecting homes plus it plays an important role in commercial, retail and industrial situations. Voltage Stabilizers will automatically maintain a constant voltage level; this could either be a simple forward-feed design or negative feedback control loops. Some Voltage Stabilizers use electromechanical devices or electronic parts. All depending on design it could be used to regulate one or more AC as well as DC voltages. A voltage regulator is designed to automatically maintain a constant voltage level. A voltage regulator may be a simple “feed-forward” design or may include negative feedback control loops. It may use an electromechanical mechanism, or electronic components. Depending on the design, it may be used to regulate one or more AC or DC voltages. A Voltage Stabilizer is an electrical device which feeds continuous voltage current to electrical appliances and devices such as computers, stoves, fridges, TV’s as well as numerous other gadgets when there are power dips and surges, brown outs or black outs – the perfect back-up system for when the lights go out.Voltage Stabilizers work on the principle of a transformer where the input current is connected to primary windings and when output is received from secondary windings. When the incoming voltage dips it activates the electromagnetic relays which add to an elevated number of turns in the secondary winding, and in turn this puts out a higher voltage which compensates for the loss of output voltage.When there is a rise in the incoming voltage the reverse is true; the voltage at the output side remains almost unchanged. The need for effective, high-quality power supply to consumers right across the globe is fast becoming a valuable resource as it plays a vital role for the reliable working of equipment and electrical devices in factories, homes, businesses and numerous applications where electricity is used. Voltage Stabilisers play a vital role in today’s modern world of technology – the question is – are you confident being without this life-saving (and appliance-saving) device?